I made a goal to read more contemporaries this summer, since I am being a little burnt out by all of the sci-fi and dystopians I read (sacrilegious words from my mouth). Shark Bait is a book I'd been meaning to read for a while but didn't get round to purchasing a copy until recently, so I decided to make it the first contemporary of my summer. That was definitely a good decision! Shark Bait introduces us to Camie, who is starting public school for the first time after being homeschooled for so long and has pretty much been thrown into the deep end. On her first day, she sees the gorgeous Tristan Daniels and becomes determined to make him hers. With the help of her new friends Kate and Melissa, who have known Tristan for an eternity, she plans to get together with Tristan and all kinds of kookiness ensues. 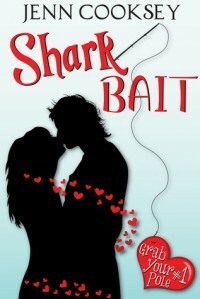 While I did enjoy Shark Bait's story, I thought that certain parts of the story happened just a little bit too fast that at the beginning it felt just a little bit like the dreaded insta-love. Thankfully, it sort of wasn't and Camie might have been purposefully exaggerating. I loved how light-hearted and funny the story was, which is what I needed after reading so many dark-ish books with sad endings lately. I found myself smiling while reading and even laughing at times (I very rarely laugh at books), which is a definite plus in my book. From the first sentence, I knew that I was going to like Camie. I loved how witty she is, how smart she is and also how she didn't become like a little lovesick puppy whenever things didn't go right. Whenever something went wrong, she knew that she had messed up badly and needed to fix it as soon as possible before it started to eat up her insides. I really enjoyed reading her narrate the story, which didn't bore me at any point at all. I had a little bit of a mixed reaction to Tristan and my attitude towards him changed just a little as the story progressed. At first I liked him, he was a super nice guy who just happened to be hot and he was also witty like Camie and the two of them would fit together like a hand in a glove. However, a little bit into the middle of the book I started to not like him as much as I did before because something that happened made him act completely irrationally and take his anger out on Camie without listening to reason. Not cool, dude. Not cool. There were a few moments where this happened again, but thankfully everything was resolved and I started to like him again. Yay! I love the way that Shark Bait is written. Even though I might not understand them sometimes, I love pop culture references and there are plenty of them peppered throughout the book. I'm not an expert on 1980's pop culture or Buffy the Vampire Slayer, so there were plenty of things that went over my young head, but that's okay because I still found them fun and, honestly, if a guy asked me out by quoting a line from my favourite TV show (I don't know how that would work, since there isn't much romance in the shows I watch) I would say yes in a heartbeat. I loved how funny the book is, thanks to Camie's witty personality, and I also loved the more tender moments in the story. Despite a few issues I had with the story, I really enjoyed Shark Bait. I liked its humour, its romance, its characters and its numerous pop culture references. I had a lot of fun reading the book and I will definitely be continuing with the series!